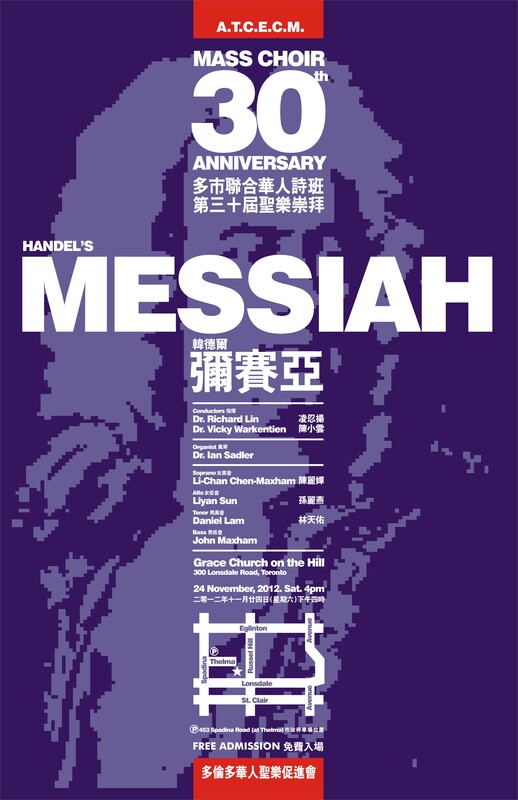 This year’s “Messiah Sing” will begin with a 45-minute lecture by our conductor, David Chin. He will give us fascinating insights into this masterpiece, the composer, historic perspectives and its relevance to our music service. The last part of the event is our reunion dinner ($10 per head), which will take place at TCMC’s basement. Stay behind and get to know brothers and sisters who also serve in music ministry! Regrettably, David Chin cannot make it to this music worship service. 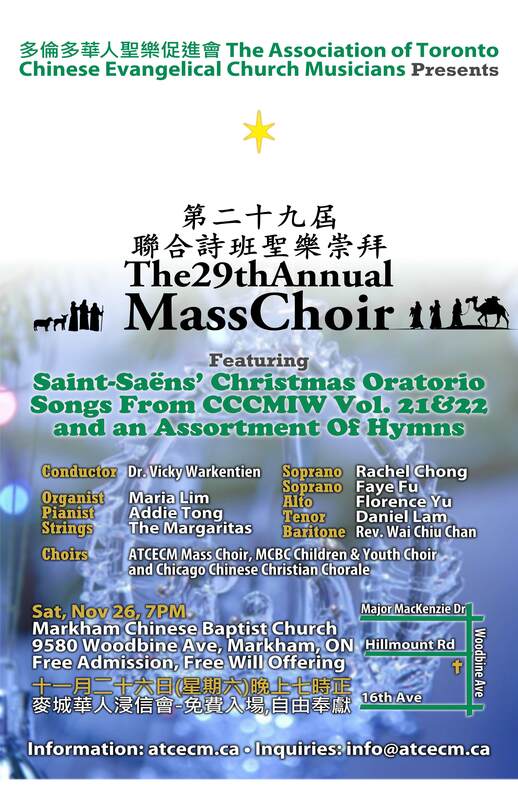 We are pleased to have Kai-Ton Chau to conduct the mass choir presentation. Welcome to our website, where you will find all our updates! Our conductor for this worship service is Dr. Vicky Warkentien. Date: November 24, 2012 (Saturday), at 4:00 p.m. Date: November 26, 2011 (Saturday), at 7:00 p.m. Date: November 20, 2010 (Saturday), at 7:00 p.m. 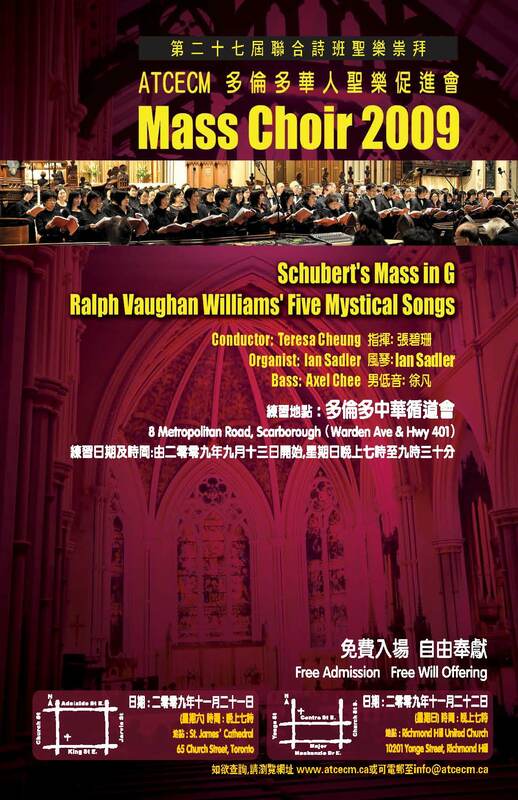 The 27th Annual Mass Choir (2009) will be singing Schubert’s Mass in G and Vaughan Williams’ Five Mystical Songs. We are very honored to have Ms. Teresa Cheung as our conductor, Dr. Ian Sadler as our organist and Mr. Axel Chee as our Bass soloist. (1) Date: November 21, 2009 (Saturday), at 7:00 p.m.
(2) Date: November 22, 2009 (Sunday) at 7:00 p.m.